The unique hand-written, personalised message on each insole. Photograph by James Munro. To look at, a Paolo Scafora shoe is an ingenious representation of true Neapolitan craftsmanship. But for this particular brand, the signature details that define it are hidden. 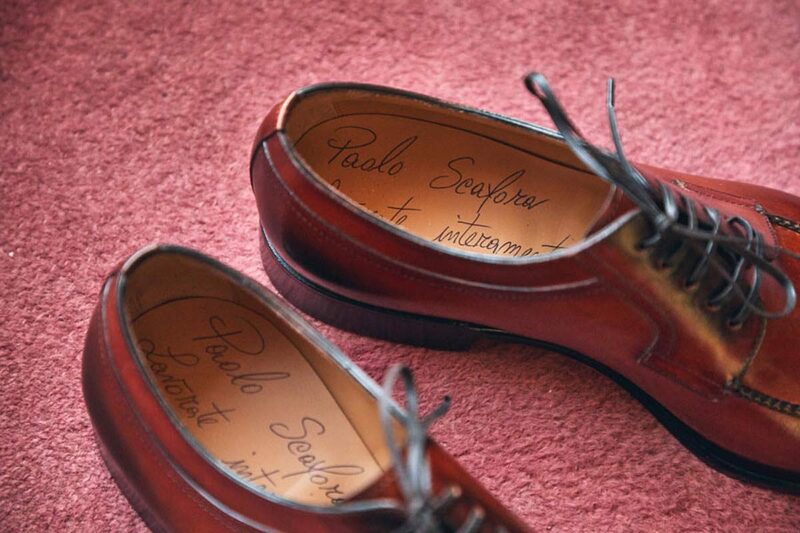 Each shoe crafted in the Paolo Scafora workroom has the name of the customer it’s been made for scrawled on the inner sole, as a discreet yet personal show of appreciation. This small dash of Scafora personality, followed only after 300 meticulous quality checks are carried out, show that the customer, and his interpretation of the brand, is at the centre of all that matters. While the brand is officially named after Paolo Scafora, he is actually the third generation Scafora to take the helm of the company. His father, Gennaro, inherited his love and talent for shoemaking from his own father, who was also gifted with cordwaining skills. In the seventies, Gennaro opened a small workshop producing leather soles, where his many children, including Paolo, played an active role in the day-to-day operations. Paolo explained to The Rake that he spent his school holidays in the family workshop, getting to grips with the machinery and learning how to accurately handle the leather. When he reached his twenties, Paolo moved to Milan to further develop his craft. The brand continued to strive – so much so that Scafora soon became one of the highest-regarded brands among its peers. However, to combat competition and the industrial production advances that threatened the integrity of bespoke shoemaking, the family had a tough decision to make; to either continue manufacturing as they had been, or resort to their original methods. They opted for the latter to maintain the essence of the Scafora brand and to stay true to their humble beginnings. Paolo took the reins in 2005 and the brand, as it is today, was born. Scafora describes his production process as a collection of unique ‘islands’, each with a small group of artisans specialised in their respective manufacturing processes. Everything is finished in-house, with the leather cutting and sewing taking place in one plant, and the final touches being taken care of in the other. Each shoe is still meticulously handmade, but this particular routine means that its creator optimises the quality of each segment of the shoe due to his or her distinct skill. This tried and tested routine encourages young workers to learn quickly – Paolo says the apprentices are treated like “blank sheets on which we can write our rules”. When asked what was unique about a pair of his shoes, Paolo replied that it was a combination of “Passion for the craft, obsessive attention to detail and a refinement that can only be learnt by doing – a Paolo Scafora shoe embodies traditionalism with modern trends to stay abreast of the ever-growing market”. This traditionalism is characterised by the regal coat of arms ‘Terra di Lavoro’, translated to ‘Land of Work’, within the Paolo Scafora logo. This logo is also comprised of two lions to represent strength and bravery, ‘Genius Loci’, which is said to provide protection to the workers in the local community, and ‘Neapolis’, the territory where Paolo Scafora originates from. As much as family ties and traditionalism fuel Paolo Scafora and his team, the brand doesn’t shy away from innovation. To improve the flexibility of its shoes, Paolo introduced ‘Extrema’, a variation of the time-honoured Goodyear welt that has been adapted for improved flexibility while still adhering to ancient construction methods – a process that has been proven to prolong a pair of shoes’ lifespan. However, whilst an innovative approach to design reaps its rewards, proven processes such as the Norwegian welt, ascertained by a unique 'twist stitch' around the entire edge of the sole, shouldn't become obsolete. For this distinctive stitch, whilst extremely laborious, to also be executed perfectly, takes an highly experienced craftsperson with the highest quality tools. But practices such as this further exemplify the, as deemed by Paolo, 'unmatched artisanal allure' of his offering. While Paolo Scafora is entrenched in traditionalism, the man himself maintains that as long as his clients continue to show appreciation for his craft, and as long as his employees practice the Paolo Scafora values, the passion, which has been metastasized through generations and illustrated by the shoes themselves will, without doubt, endure. 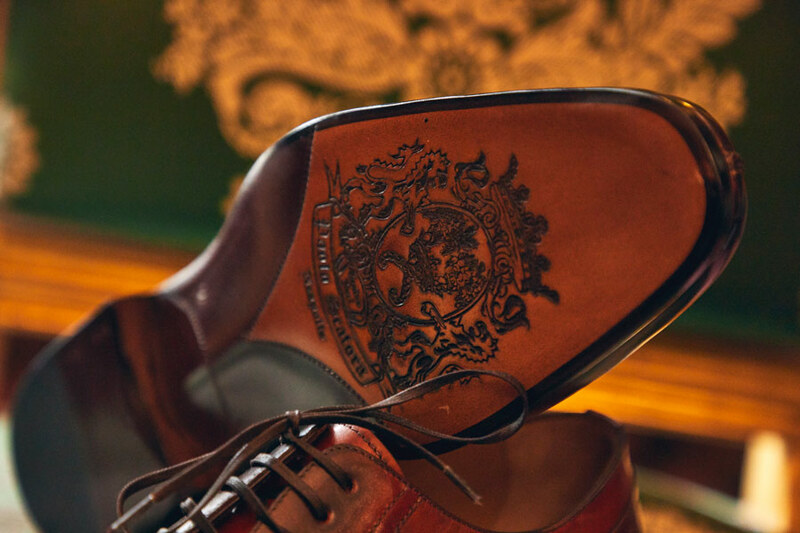 The signature Paolo Scafora logo hand-applied to every sole. Photograph by James Munro.